ST-R-I-P overcomes its somewhat fiddly interface to deliver 'desk-style' vibe and sounds at a bargain price. Good-sounding EQ and compressor. Useful pre-EQ trim. Scalable GUI. Context-sensitive tooltips. Heavy on the CPU. Labelling hard to read when scaled down. Hamburg-based developer audioD3ck are recent entrants into the plugin arena, and as we discovered with their Krucz limiter, their rather excruciatingly subheaded R.A.O.N. (Ridiculous Amounts Of Noise) processors aim to bring authentic analogue flavour to your processing arsenal. ST-R-I-P is, unsurprisingly, a channel strip (VST/AU), combining compression and EQ. It's not modelled after any particular desk, although the EQ appears to be loosely based on the Neve 1073, and the whole thing deliberately features some of the typical limitations of older designs compared to modern plugins, such as fixed- shape EQ bands. Let's start with the compressor, which is a feedforward design with an RMS detector and manual gain make-up. 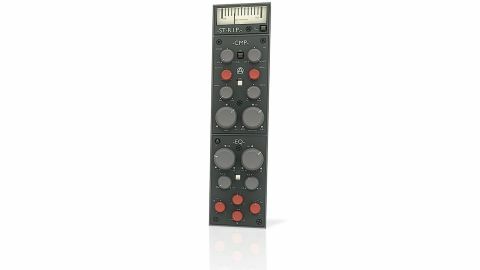 It boasts an adjustable high-pass filter (20-320Hz) on the sidechain and can be set to work in stereo or mid/side mode. "The higher band is great for adding crack to snares and presence to basses and vocals"
The Ratio is freely adjustable (from 1:1 to inf:1), as are the Attack (0.04ms to over 1s) and Release (78ms to around 10s). Knee shape and mix blend controls are on hand, too. The compressor is very responsive. The high ratio option works well for squashing snares and kicks, and is particularly effective used in conjunction with the mix control. It also does the trick on electric guitar, bass and vocals. The EQ is a four-band job, each band offering +/-15dB of gain. Specifically, you've got two peak bands (80Hz-2.2kHz and 1.2-15kHz), a variable low shelf (40-520Hz) and a fixed high shelf (12kHz). This quartet is backed up by a 12dB/ octave variable high-pass filter (20-320Hz). As mentioned, the EQ is loosely based on the Neve 1073. What this means in practical terms is that the resonance of each peak band (none of which have Q controls) narrows slightly as the gain increases. The higher band is great for adding crack to snares and presence to basses and vocals, while the lower band covers a broad frequency range and so does a good job of adding body to snares and sculpting the mid-range of vocals, synths, guitars and so forth. The high-pass works well in combination with the low shelf but, at just 12dB/ octave, is a bit gentle for surgical work. Similarly, the shelves excel at gentle sweetening, although we found that the low one delivers a steeper profile than the high one. The EQ and compressor each have their own on/off buttons, and there's a level trim pot (+/-15dB) on the EQ input. A signal flow switch enables the EQ to be placed pre/post compressor, as the user sees fit, and there's a gain reduction meter at the top of the interface. The R.A.O.N. architecture incorporates low- level noise and harmonic distortion, so ST-R-I-P exhibits some level-dependent 3rd and 5th harmonic accentuation, making for a pleasantly enhancing effect. On the down side, we found the compressor to be pretty CPU intensive, although since its initial release, ST-R-I-P has seen the beneficial addition of various oversampling and High Quality options in the Settings page, which make this manageable. There's also the fiddliness of the parameter labelling - discussed in Size matters - to consider. Nonetheless, this a very impressive plugin for the price.